How was your flooring business this summer? Was it disappointing? Did customer counts come in lower than anticipated? Did buyers express even more preference for “value” products? Where did the optimism go for a 2010 recovery? I was optimistic earlier in the year when I posted "Catalina says U.S. Flooring Industry Set For Spring Thaw-Who Will Benefit?". In that April post I indicated that there would be a recovery in the second quarter and the recovery would accelerate over the entire year. 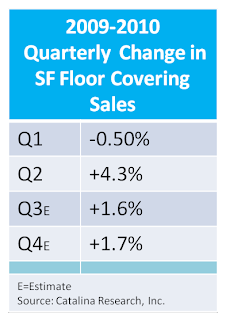 Recent data shows that there was a 4.3% increase in U.S. manufacturer square foot floor coverings sales in the second quarter over the previous year. This was the first increase in U.S. demand in almost four years as retailers restocked in anticipation of rising consumer floor coverings purchases. • The Flash Crash in May, when the U.S. stock market plunged 600 points, unnerved investor confidence in the stock market and contributed to a renewed decline in household wealth. • The Greek Meltdown made consumers finally consider the adverse effects of the soaring debt levels of federal, state, and local governments. • The Gulf oil spill reopened the discussion about the lack of a U.S. energy policy, and how quickly prices could rise due to a supply disruption. • Consumers began to digest how health care, financial service, and tax legislation will impact their own household budgets, while U.S. employment levels continued to decline. • Cut their debt levels and increased their savings rate as households worked to increase funds to pay for rising health care costs and offset the shortfall in company and government retirement plans. • Reduced their purchases of new and existing homes. Existing home sales declined by 26.9% in July, after consumers increased their purchases for existing homes at a double-digit rate in the first half of 2010. Builders also sharply reduced their starts of new homes in recent months. • Slowed their purchases of building materials and home furnishings. 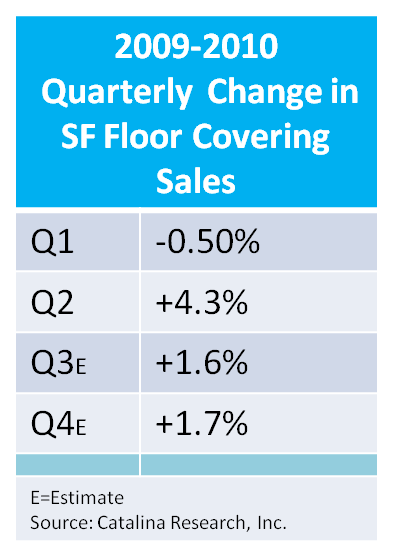 In fact, the sales decline at specialty floor coverings stores accelerated in July. These consumer actions are estimated to cause U.S. manufacturer square foot floor coverings sales to slow to an estimated 1.6% gain in the third quarter of 2010. Sales could grow at a similar rate in the fourth quarter of this year. This sluggish recovery is expected to continue until consumers regain confidence in their ability to get a job, improve their ability to pay for medical care and save for retirement, and trust in their government to meet its obligations without bankrupting the country. This may take some time. Let us know how the above events changed the attitude of your customers, and how they have changed their spending patterns over the past few months. How relevant do you consider the web to you and the floor covering industry? I consider it significant. I believe that access to information online is paving the way to a new world order. In case you haven't yet had an epiphany similar to David Wootton's in Flooring and the Internet - Now I’m a Believer, I'd like to put this new world order into consumer and business context and get your reactions. When you're in the market for a product or service, how do you go about getting information before purchasing? Do you get into your car and drive around? Or do you sit down in front of your computer and type in Internet search terms in an online search engine such as Google, Yahoo! or Bing? I start online. Even if I plan on driving around, I'll start at the computer to double-check locations, hours of operations, availability of parking [or access to public transportation] and to confirm product selection. Even for flooring. Here's what I find so fascinating about the new world order. It results from online technology - easy-to-use technology that enables search, engagement, conversation, interaction and community-creation. It's a democratic tool breaking down geographic, educational, cultural and personal boundaries. It's increasingly becoming mobile, too! It allows like-minded individuals to connect and share information. It facilitates crowd-sourcing, co-creation, unexpected problem-solving and amazing cooperation. It allows corporations to engage in conversations with customers, employees and those passionate about your brand, product, company and industry, while establishing trust and credibility. Imagine the benefit for a high-involvement, complex product such as flooring! The other fascinating aspect is that those taking part - in blogs, LinkedIn, photo-sharing, online reviews, Facebook, help boards - are no longer at the fringe. They are you and me! Entrepreneurs, corporate business people, retirees, school teachers, parents, grandparents, operators, etc... Men and women. Our core floor covering consumers, too, many of whom spend a significant portion of time on sites such as Facebook exchanging life stories and brand perspectives. Do you still think that floor covering's new world order isn't significant? By the way, did you know that the Floor Covering Institute has a Facebook Fan Page? So does my company, Simple Marketing Now. Come visit and be sure to LIKE us! Jon Trivers nicknamed me “Jimmy the Grout.” At CCA they called me the “Cork King” because I loved cork flooring. As their Chief Product Officer I could have covered my office floor with any product but I chose cork which, at the time, was unique. It was quiet, resilient, warm, wore well and, most importantly, that floor encouraged people to think outside of their paradigm. 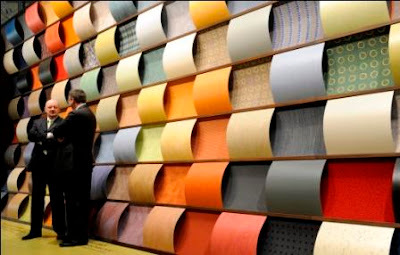 I think that is the same reason I love going to Domotex Germany and Domotex Asia China Floor every year - because what I see challenges what we hold as the norm in North America. When carpet still had over 70% of the floor covering market here, Scandinavia’s carpet market had fallen to 10% share! While Americans were stuck displaying carpet on waterfall fixtures, Europeans were using sophisticated lighting and design to showcase carpet as fashion. While sheet vinyl was only available on felt here, Europe used fiberglass to make it more flexible and dimensionally stable. And of course, Europe is where I discovered laminate flooring. I guess most people in our industry that do not know me well think of me as that guy that brought Pergo to America. What really happened is Paul Murfin (now an executive at Armstrong) and I were walking through the Domotex Hannover show in January of 1992 looking for a unique wood supplier when we stumbled upon the Pergo exhibit. Laminate had been sold in Europe for well over a year but back in the states we had not yet heard of it. I remember telling the people at Armstrong about it and they had no idea what I was talking about. Since then every journey to a flooring show on another continent has yielded at least one idea or one discovery that made the trip worthwhile. Visiting Germany and China wasn’t all bad since I love to travel but from a purely business point of view these trips paid for themselves many times over. Domotex is where I first saw glueless laminate. In fact, it was the demonstration of Alloc’s aluminum locking system at Domotex that gave Unilin the idea that they could profile the tongue and groove to lock together. Meister showed wood veneer attached to an HDF core at Domotex long before Shaw introduced their product. High gloss laminate was displayed years before Armstrong introduced Grand Illusions. Also discovered at these shows…click LVT, printed bamboo that looks like exotic woods, clicking ceramic tile, and the list goes. For a guy who loves flooring it doesn’t get better than these treasure hunts. America is the largest consuming market for floor covering in the world. That does not mean we have a lock on innovation, product advancements or fashion trends. The truth is that innovation and inspirations in flooring come from all over. Over 1,400 manufacturers exhibit in Hannover and over 1,000 in Shanghai. Many of these are manufacturers you wouldn’t recognize, but then at one time we didn’t know Pergo or Unilin either. If you are interested in looking into the future of floor covering spend just a few days at one of these shows and you’ll feel like you’re gazing into a crystal ball. 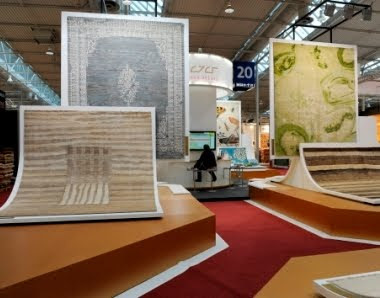 Domotex Hannover runs January 15-18, 2011 and Domotex Asia runs March 21- 24, 2011. Both shows are worth the trip and I hope to see you there. Feel free to contact me if you have questions about attending as either a visitor or an exhibitor. One obvious opportunity maybe joining a buying group or aligning with a manufacturer. Just as obvious, it may be the right time to drop-out or change your buying or aligned group because the buying group that fit your organization ten years ago may no longer be right for your company now. Most importantly, find the organization that fits your strategic market position. A group that stands for everything means nothing to all. There are reasons why Brooks Brothers doesn’t sell polyester dress shirts or why Sub-Zero won’t sell their brand to Lowes. It’s akin to why Nordstrom doesn't sell Dickies® shirts or Wrangler® jeans. Nordstrom and Walmart know their customer base and focus their marketing mix - the product, price, place and promotion - on those customers. Read Nordstrom vs Walmart: Marketing Strategies. Customers do not respond well to stores that pretend to be both Nordstrom and Walmart. If your buying group is moving you into both higher and lower-end products they might not be helping you. You’ll lose customers if they can’t immediately identify what you “stand-for” i.e. ; your company values. Adding exclusive brands is easier now too. Buying and aligned groups, as well as exclusive brands, are taking a second look at expanding their delivery channels to customers because they need the business. This means that having another dealer in town may no longer eliminate you from carrying a heretofore exclusive brand or marketing program. The world is up for grabs; now is the time to explore new marketing and merchandising opportunities. Investigate. You may be surprised what you find. 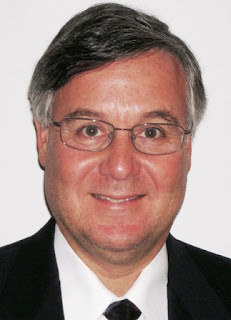 Chris Ramey is president of Affluent Insights and a member of the Floor Covering Institute.